Midloathian, VA – Thomas Stinson qualified fifth during practifying but after the invert and Mason Bailey heading to the rear for two consecutive wins he sat on the pole. Sitting beside him on the outside was Tyler Davis in the 00. Stinson quickly pulled out on the field with Davis falling in line to keep in second. Behind them Chris Hoylman and Kyle Wood ran side by side for three consecutive laps. Hoylman completed the pass leaving Wood to fend off a fast Bailey who quickly got up to fifth after starting in last place. By the eighth lap Bailey was using his bumper a little on Wood as the entire field was single file. Ten laps later the great battle was still continuing on with Mason bumping Kyle hard enough to get himself loose as he had to back off quickly. With seven laps left Stinson had a big lead on the field as second trough fourth all battled bumper to bumper. A couple laps later and Mike Bedner became the first car to go a lap down in the race. Coming to the checkered Wood would get around and wreck letting Bailey through for a third place finish and an easy win for Thomas Stinson. In victory lane Stinson commented after his fifth win for the year that this may have been his last race, especially with a win and being able to go out on a good note. In the final points he only finished five behind Bailey, close to getting him another Southside title. Midloathion, VA — Nineteen late models rolled in to the Toughest Short Track in the South for the season finale on a hot Friday evening outside the state’s capital. Steve Zuskin came into the night sitting second place behind Chris Dodson by four points. Dodson set fast time in practifying with a 15.185 second lap time with the always fast Eddie Johnson tying him on the last lap of the session. The pole, and the single point for winning it, was given to Dodson based off of series points. Steve Zuskin qualified ninth after having to do some repairs to his car from earlier in the day. They pulled a three car invert putting Bugs Hairfield out in front of the field. Early on there would be a wreck involving a few cars and Zuskin would narrowly miss it and would improve his position up to sixth. On the restart Bugs would have to fend Eddie off of the top line where he has been able to run well this season. By the ninth lap Johnson would get in line and start applying pressure to Bugs’ bumped. Eddie gets by him and Bugs falls to third while the caution comes out on lap 17 for Woodie Ellington spinning in turn 1. Barely a lap after the restart Andrew Dean got turned around in turn 3 smashing in some fenders of other drivers. Bugs took advantage of this caution to try and get a grip on his ill-handling car. The top-5 at this point was Eddie, Dodson, Brad Davis, Zuskin, and Rookie of the Year Grayson Cullather. Another lap of racing and another caution flag would fly, this time for RotY runner up Daniel Thomas getting spun out. Eddie Johnson had the restarts locked down all night, easily clearing Dodson by turn one. Thomas and Zuskin pulled in to end their nights on a lap 21 caution after a couple green flag laps, giving Dodson the series championship. On lap 27 Dodson started to put some pressure on the rear of Eddie and even while racing hard for the lead they were still clearing the field pretty well. Caution flies again on lap 31 for Rusty Wood spinning out of turn 4. With five laps remaining Raymond Pittman and Cullather get together putting Greg Fernandez and Andrew Dean into the top-5. Eddie kept on top of the restarts and would cruise to the checkered flag to cap off a very successful partial season that he ran in the 43 car. Fernandez gave all he had to Davis but could not get around him for third place. Chris Dodson won his 8th track championship with 6 wins on the season and Steve Zuskin wrapped up second on the season while Greg Fernandez finished in third in his final season of racing. This season the late model division grew large at Southside Speedway with lots of new drivers and a couple of the old drivers coming back out. Next season should be pretty competitive as some of the young guns come back with a year of experience under their belts. 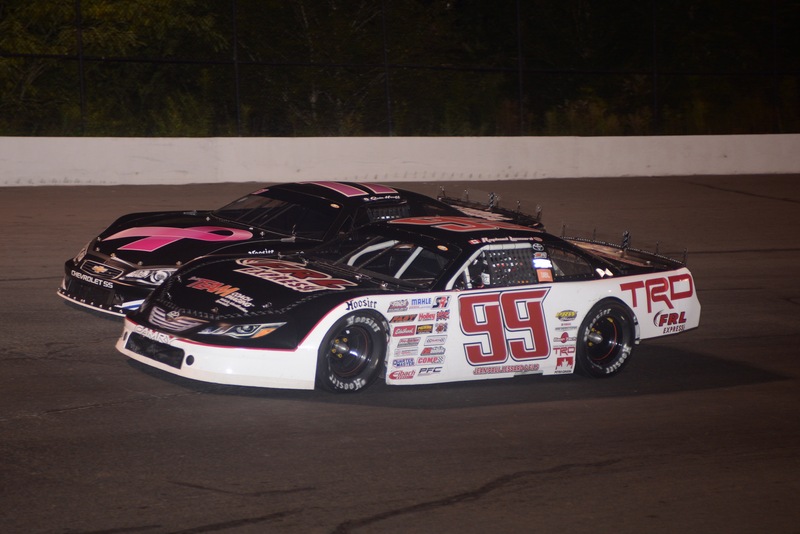 South Boston, VA – Austin Thaxton, of South Boston, Virginia, recovered from a spin early in the race and came through the field to win the 100-lap “Italian Delight Family Restaurant Frutopia Not Just Frozen Yogurt NASCAR Late Model 100” at South Boston Speedway on Saturday. Matt Bowling, of Ridgeway, Virginia, has held the NASCAR Whelen All-American Series national points race all year but held only a single point lead entering Saturday’s race. Bowling, who has eight wins and holds a 63-point lead over Peyton Sellers in the points battle at South Boston Speedway, started mid-pack but took the lead from Bruce Anderson of South Boston, Virginia, on lap 27 and held a comfortable lead until shortly after the race’s second and final caution on lap 53. Thaxton had moved to third by lap 80 and passed Danville, Virginia’s Peyton Sellers on lap 83, before tracking down Bowling on lap 93 and holding on to win the race by 1.276 seconds, his fourth win of the year. Sellers finished second, followed by Josh Oakley, of Rougemont, North Carolina, Bowling and Mark Wertz, of Chesapeake, Virginia. Thaxton captured his second pole of the season with a time of 16.048 seconds (89.731 MPH). Joey Throckmorton closed in on the Limited Sportsman Division title with his 10th win of the season on Saturday, passing Daniel Moss of Danville, Virginia, on lap 28 and pulling away from the field to win over Mike Jones, of South Boston, Virginia by 2.751 seconds. Moss finished in third place, with Colin Garrett of South Boston, Virginia, and Bob Davis, of Thaxton, Virginia, rounding out the top-five finishers in a race that had one caution. Barry Beggarly, Jr., of Providence, North Carolina, captured his first pole of the season with a time of 16,371 seconds (87.960 MPH). Joe Allred III, of Scottsburg, Virginia, grabbed his first win of the season in the 30-lap Pure Stock Division race, starting back in the field and working his way up before passing Randy Hupp, of Halifax, Virginia, on lap 27. Hupp finished second, with Bruce Mayo, of Halifax, Virginia, and points leader Johnny Layne, of Nathalie, Virginia, rounding out the top-four finishers in a race that had one caution. Layne, who has seven wins on the year and elected to start at the rear of the field for passing points, won his seventh pole of the year with a time of 18.739 seconds (76.845 MPH). The points battle in the Hornets Division became even tighter Saturday with Kenny Mills Jr. of Alton, Virginia, winning his third race of the year. Mills, 16 points behind Todd Garnett at the beginning of the race, took the lead on lap eight of the 15-lap race and held on to win over Frank Wagner of Nathalie, Virginia, with Drew Dawson of Nathalie, Virginia, and Jared Dawson, of Nathalie, Virginia, rounding out the top-four finishers in a race that had three cautions, with Garnett not finishing the race after an on-track incident. Jimmy Rice, of Gibsonville, North Carolina, driving a 1963 Ford Falcon, and Corey Agee, of Martinsville, Virginia, driving a 1938 Plymouth Coupe, were the Sportsman and Modified division winners in the 25-lap race for the Southern Ground Pounders Vintage Racing Club race. Sparky Staton, of Charlottesville, Virginia, driving a 1955 Chevrolet, finished in third place, and Jay Royal, of South Port, North Carolina, rounded out the top-four finishers in a caution-free race. It will be Championship Night when NASCAR racing action returns to South Boston Speedway Saturday night, Sept. 3 with the 7 p.m. running of the GCR Presents Spaulding Equipment Co. NASCAR Late Model Twin 75’s racing program. There will be plenty of excitement as South Boston Speedway officials crown the track champion in the NASCAR Whelen All American Series Late Model Stock Car Division and the Limited Sportsman Division. Five races are on tap with twin 75-lap races for the NASCAR Whelen All American Series Late Model Stock Car Division competitors headlining the action. A 50-lap Limited Sportsman Division race, a 30-lap race for the Budweiser Pure Stock Division and a 15-lap race for the Budweiser Hornets Division round out the night’s action. Registration and pit gate opens at 2:30 p.m. and practice will start at 4 p.m. Grandstand gates open at 5:30 p.m., qualifying starts at 6 p.m. and the first race gets the green flag at 7 p.m. Adult General Admission tickets are $10 each, with youth ages 7-12 admitted for $5 and kids ages six and under being admitted free with a paid adult. For additional information about the GCR Presents Spaulding Equipment Co. NASCAR Late Model Twin 75’s racing program or any other events at South Boston Speedway, please visit the speedway’s website at www.southbostonspeedway.com or telephone the speedway at 434-572-4947 or 1-877-440-1540. Robersonville, NC – “Man that was one of the most fun I have had in a race in a long time,” an excited Thomas Burbage said in victory lane the past weekend at East Carolina Motor Speedway. Burbage had shown speed all afternoon and it transferred to both qualifying and race time. Despite having minor scoring issues, that were fixed before race time, Burbage tied for the pole position with points leader Brenden Queen with a time 15.44 seconds. Burbage would have to settle for the outside pole after race control confirmed per track rules the “advantage” would go to the diver who clocked their lap first. After an intense battle for the lead, Burbage was able to get around Queen using what a lot of people at East Carolina have a hard time using – the high line! “It’s hard to pass on the outside here,” Burbage also said in victory lane. “Specially with Brenden on the inside of you. He’s a good driver and he will certainly make you work for it. I’m just so happy to be out of this drought.” Things seemed to get off to a rocky start quite literally when flagman Terry Bullock did not like the original start, waiving it off calling for take two. There was however a large delay in the caution lights as the field set off into one causing the middle of the pack to stack up. Terry Carroll of Williamsburg, Va got the worst end of that deal and ended up nose first into the outside wall. His night was over before it even had a chance to get started. The field was reset and would make a second attempt at the start. This go round was much better and the field went to work out of two. Burbage wasting no time applying pressure to Queen to his inside. The two put on quite a show for the next three laps with Queen edging him at the line each lap. After getting some good heat in the tires Burbage’s car really seemed to hook up and that’s when he took the lead from Queen and never looked back. There was a brief battle behind them for the third spot with Louis White, who is locked in a very tight points battle with Queen for the track championship, getting by Tyler Matthews and locking his sights on Queen for second. Michael Fose and Justin Carroll would also go to work for several laps battle for the fifth position. Carroll doing everything in his power to keep Fose at bay creating some pretty exciting racing for sure! Couple interesting moments for the leaders working through lap traffic that could have ended worst than they did. Burbage ended up catching a pair of lap cars who were battling for position coming to ten to go. Luckily the two were able to sort things out and did not hold up the top two drivers. Louis White on the other hand had a scary moment in turns three and four that found himself chasing his car up e hill after making contact with Maddy Mulligan’s car who looked to push up the racing surface. White was able to gather things back up and Mulligan kept her machine straight to finish the race. Burbage would go on to finish within the top five in the second 40-lap feature of the evening. Though it was not a sweep, a top five is nothing to shake a stick at. Burbage told us he just missed the adjustment from the first to second race but was pleased with all the hard work from his guys and his sponsor Oakridge Metals. Robersonville, NC – After a couple weekends away from the racetrack we are back at it again this week from the high banks of East Carolina Motor Speedway just in time for things to heat up in the point’s standings – both at the track and within the state. Brenden Queen enters the weekend two points ahead of Louis White – winner of race number two just two weeks ago – finishing one position behind Louis both times. Queen, who is also tied with White with the most wins in the state of North Carolina with four, also enters the weekend ten points ahead of Louis in the state points. Both drivers still running strong in the top 25 in the national points standings, which concludes September 18th. Tyler Matthews and Michael Fose come into the weekend tied for third in the state standings at an even 530 points from their efforts at both East Carolina and Southern National. Currently sitting fourth and sixth respectfully in the track standings both drivers have their work cut out for them in these final few races if they want to make any noise in the championship hunt. Thomas Burbage, who had some pretty intense battles with Queen earlier in the season, is currently sitting third in the track points fifty-four points behind Louis with six points races left on the schedule. Jesse Council also added to his points lead over both Kevin Benton and Travis Roberson with his win last time out. Council just has three races left in 2016 to hold onto his ten-point lead and go for his second track championship in three years. Five other classes – Pro Six, Super Trucks, UCAR, Bandos, and Bombers – will take to the track this evening for the Country Mart 250 at East Carolina Motor Speedway. Controlled practice gets underway at 3:00 PM, Drivers Meeting at 4:50 PM and qualifying set to get underway following the drivers meeting. We will have LIVE coverage on our Twitter feed (@theweeklyracer) for both Late Model races this evening along with the Pro Six and Street Stocks. Coverage subject to change based on car counts. Our coverage will pick up shortly after 5:00 PM EDT with coverage from qualifying. SOUTH BOSTON, Va. – It’s crunch time for Matt Bowling. The young Ridgeway driver who calls South Boston Speedway his racing home has led the NASCAR Whelen All-American Series national points race all year. But with just three weeks remaining in the season, that lead has dwindled to a single point. And that makes this Saturday night’s “Italian Delight Family Restaurant Presents Frutopia Not Just Frozen Yogurt” NASCAR Late Model 100 even more important to Bowling. “This is a big one for us. Unfortunately, it’s just a single race and we’ll have to start mid-pack because we won the last two. But we’ve got a good car and hopefully we can contend for it. If we win, it will be big,” said Bowling. Bowling has been dominant at South Boston this season with eight wins. He has 11 wins overall in 35 starts throughout the region. He’s scored 27 top five finishes and 33 top 10s as he traveled to seven different tracks. But he has been shadowed in the second half of the season by northern Modified racer Keith Rocco. He has 12 victories in 35 starts, but has fewer top five and top 10 finishes than Bowling. Bowling admits he has been looking over his shoulder recently. Racing returns to South Boston Speedway Saturday with the 7 p.m. running of the “Italian Delight Family Restaurant Presents Frutopia Not Just Frozen Yogurt” NASCAR Late Model 100 racing program. A 100-lap race for the NASCAR Whelen All-American Series Late Model Stock Car Division competitors will headline the five-race card. Also on the night’s schedule are a 50-lap Limited Sportsman Division race, a 30-lap race for the Budweiser Pure Stock Division, a 15-lap race for the Budweiser Hornets Division and a 25-lap race for the regional touring Southern Ground Pounders series. Grandstand gates open at 5:30 p.m., qualifying starts at 6 p.m. and the first race gets the green flag at 7 p.m. Adult General Admission tickets are $10 each, with youth ages 7-12 admitted for $5 and kids ages six and under being admitted free with a paid adult. It’s also Back To School Night with all students admitted for $5 with proper ID.